Funded 576,000yen	(About $5414.4) The target amount is	$9400	This is an All-In project. Regardless of the target amount, this project will be funded with the amount of money raised. In 2018, in association with the Winter Olympics held in Pyeongchang, we received the chance to show off our special Japanese dance during the celebrations around the opening! Therefore, we went with a specially prepared dance, [MIYABI], to show of the sense of [WA] the quintessential Japanese values. Due to getting rave reviews from those that saw the performance in Korea, we wish to take to the stage in a [ONE DAY ONLY] event! We want not just those in Japan to see this performance but wish for those all over the world to come and enjoy this event, and so we have turned to crowdfunding to help move this project to the world stage! We hope that you are able to join in! Greetings all! 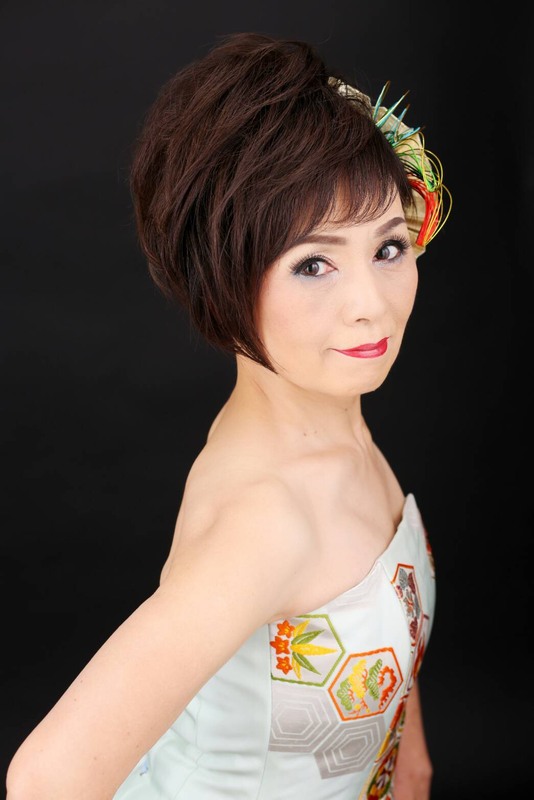 I'm Anri Noguchi and I'm the staff pianist for the Izanami project! 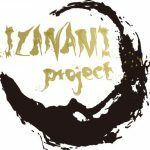 The Izanami project is a dance team in Chichibu, Saitama, where we focus on creating dances that shows off Japanese traditions and seasons! Since Chichibu, Saitama, where our dance studio is based and Gangneung City, Gangwon-do, where a number of the Winter Olympics indoor competitions were held during the Games, are sister cities, we have a long lasting relationship! For over 10 years, we have gone to South Korea to participate in certain events! Through our dances, we have been able to make a deep connection with the local people, and as such, with the local people approving of and giving us recognisition of our achievements, in June 2018 they gave out an invite to come to attend the Olympics to our director, Mrs. Noguchi. 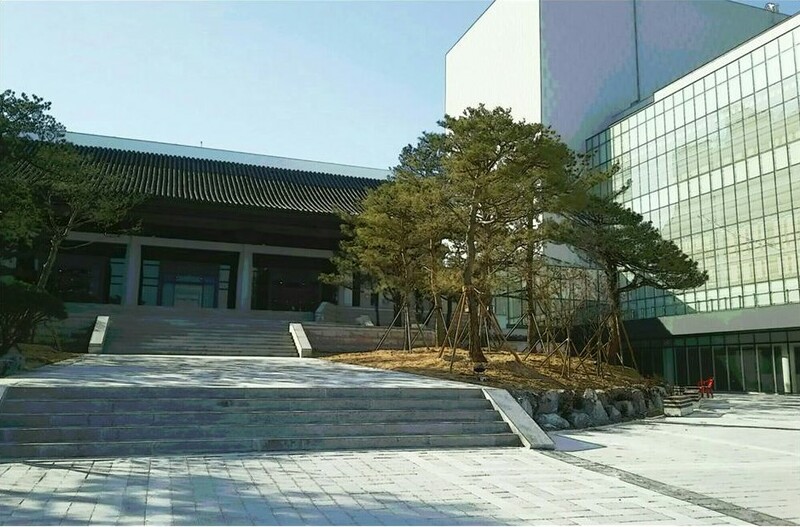 Gangneung City, being the home to that years indoor Winter Olympics sports such as Figure Skating, wanted to hold at the same time the Culture Olympics at their very own Gangneung Art Centre! Our performance was held on the same day as the Opening Ceremony at 17:30 at the Art Centre and all the tickets sold out! What does MIYABI's production entail?? 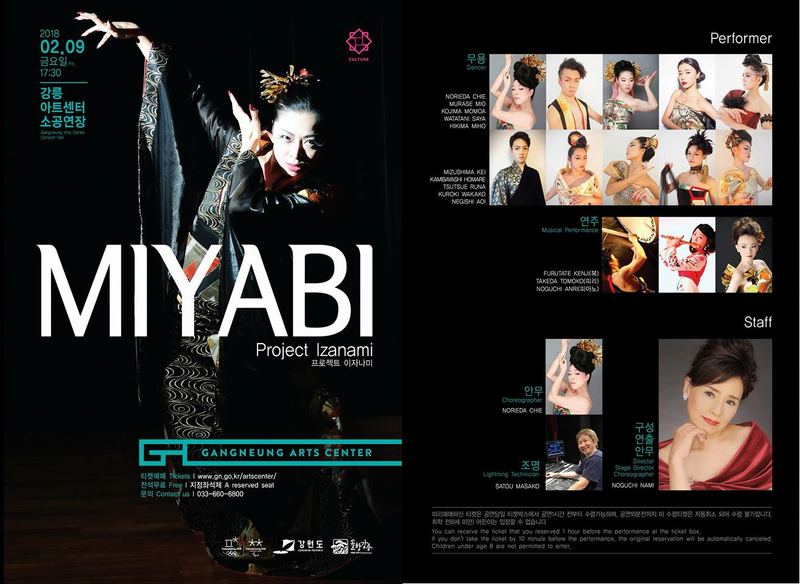 [MIYABI] is the name of the dance that our dance group, [IZANAMI project] produced and performed for the 2018 Pyongchang Winter Olympics. 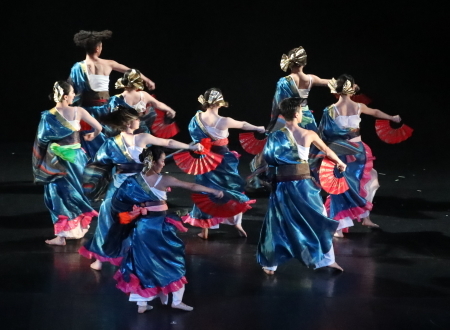 We were able to capture and show of the uniqueness and beauty of Japan in dance, and because of this we received high praise from those that saw us! 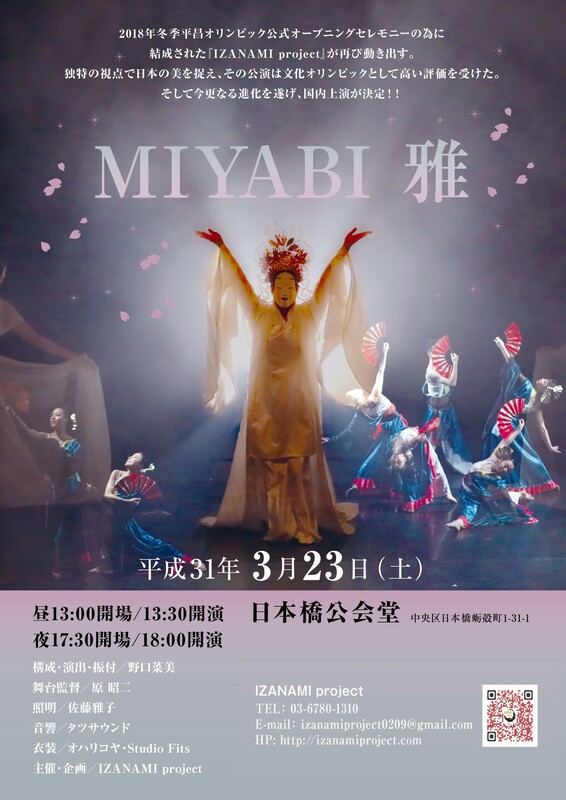 A special feature of our production is that with [MIYABI], we try to paint a picture with our dance as well as the accompanying music. Through this we try to create something that ascends words and convey the beauty and brilliance of Japanese culture and tradition. It is this breathtaking gracefulness of Japan that we wish to send to the world. Since we first performed [MIYABI] in South Korea, we have evolved and the scale of the production has increased dramatically! 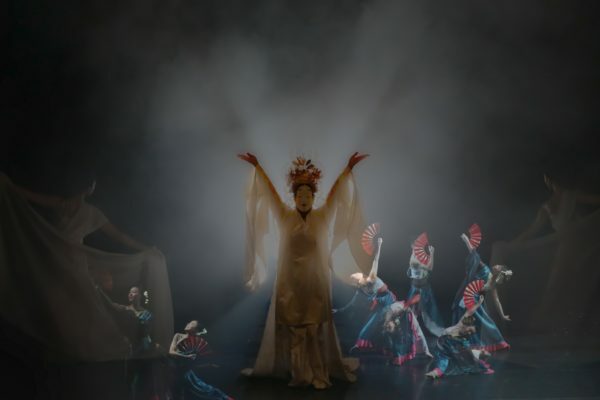 From creating new sections featuring winged nymphs, to more imagery depicting the seasons found in Japan, to special sections focusing on various types of dance such as jazz dance or modern dance, this production has improved even more than we hoped! From there we recruited dancers from all around the country. We were able to get some of the most amazing dancers in Japan, and the production that we have been able to create is a new [MIYABI]. With this production being held at a fitting time, in the final spring of the current Japanese emperor and therefore a new era coming into light, we are putting on a show to remember! With amazing colours and wonderous Japanese beauty, no part has been left out. With this show being something no one has seen before, or something no one has experienced before, this show is a new type of entertainment. Where did the chance to perform in Korea as a Japanese group come from? Our first contact we had with the City of Gangneung, they asked us to perform something with a Japanese style. Although this event was being held in South Korea, they wished for multicultural experience, with us showing off the charms of Japan. We were perplexed at first but as we gathered together from around the local area, in total 10 dancers as well as 3 musicians versed in Japanese Taiko drums, Shinobue, and piano, we came to make [MIYABI]. With this, after creating a production that shows off Japans amazing qualities, and an extraordinary amount of training and rehearsals, we landed in South Korea. With this, after so many trials and tribulations, we performed and in doing so we received praise, much higher than we expected. In the same centre, we were put together with the South Korean National Orchestra, as well as many other famous art groups from America and China and so on. The day before we performed, one of the delegations from North Korea performed! After everything, we found something that we had thought about but never really had the chance to experience. We came to realize that dance is universal, there are no walls due to language or country, there is just the moment, just mutual respect that only comes from experiencing that performers production. Creating an event that everyone can get involved in! We decided through everything that it's necessary to show off [MIYABI] in this one day only event in Japan, the productions birthplace. As we have only performed this production in South Korean, we felt that such a production should take place in a fitting place. Therefore we chose [Nihonbashi Kokaido], a stage which has a long history of great productions being performed on it. It's also a location that is easy to get to from most places in Tokyo, which means not only Japanese people but those from overseas can come and watch and feel [Japan's beauty] on stage. With this being a massive event, we are preparing a various means of people to participate. From chances to be able to interact and communicate with the dancers to creating a special channel for you to share this production with your friends, we thought the easiest way to do so would be to use crowdfunding. For those that back the project, you will receive a ticket to see our production, and we look forward for you to coming and watching. We have also prepared a various amount of returns that you will only be able to get via our crowdfunding campaign. Please help us and support our project! The money raised with be used to pay for costs incurred from things such as costume creation and so on. Introducing the Returns for backing! We want to give you the option to come see our performance but also to receive extra goods while doing so! So we've prepared some crowdfunding only returns! ・Special footage available only to those that back the project, viewable online! ・Special VIP seating for the best viewing! ・Jazz and contemporary dancer. She also has learned different kinds of dances such as Argentine tango and Flamenco. Teaching and educate dancers to make professional dancers. ・At dance competition, she has so many numbers which got prizes and she was chosen for the best choreographer. In 2017, she got a great reputation with the performance of Pyeongchang Winter Olympic Pre-Performance. After that, she got an invitation from the Olympic art committee. In February 2018, she presented the “MIYABI” on the first day of the Olympics at the opening ceremony. ・Founder of Yoga studio “RUANG SUARA” which means “Space of resonant”. She also building her career as a yoga instructor. What is the Izanami project? 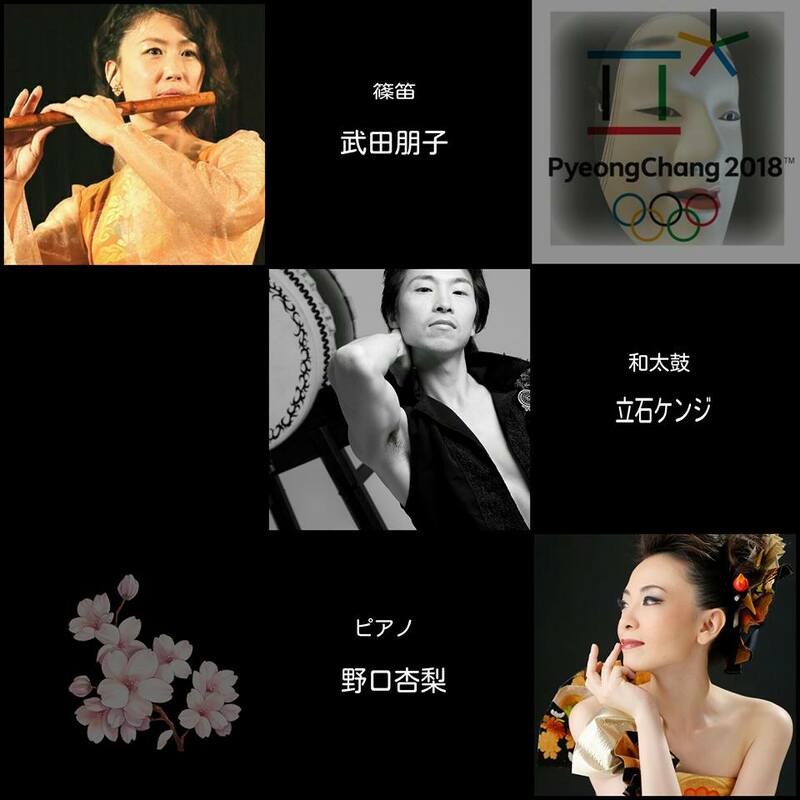 Created for the Winter Olympics in Pyongchang in 2018, IZANAMI creates productions that show of the delights and uniqueness of Japanese traditions and culture. 3 members of the dance studio STUDIO Fits (found in Chichibu, Saitama) are participating members. The name is taken from Izanami, one of the goddess in Japanese mythology. With Nami Noguchi at the head of this as Creative Director, and a varied collective of dancers in many genres, and musicians skilled in a variety of instruments, the aim is to create a new type of entertainment that allows for people all over the world to experience Japan in a different way. The hall has no parking so please don't try to drive here. Thank you for taking the time to look at our page and reading about the [Izanami project]. Although the project had its start at the Pyongchang Winter Olympics, we wish to be not just a connection between Japan and Korea, but a connection between the world and Japan. 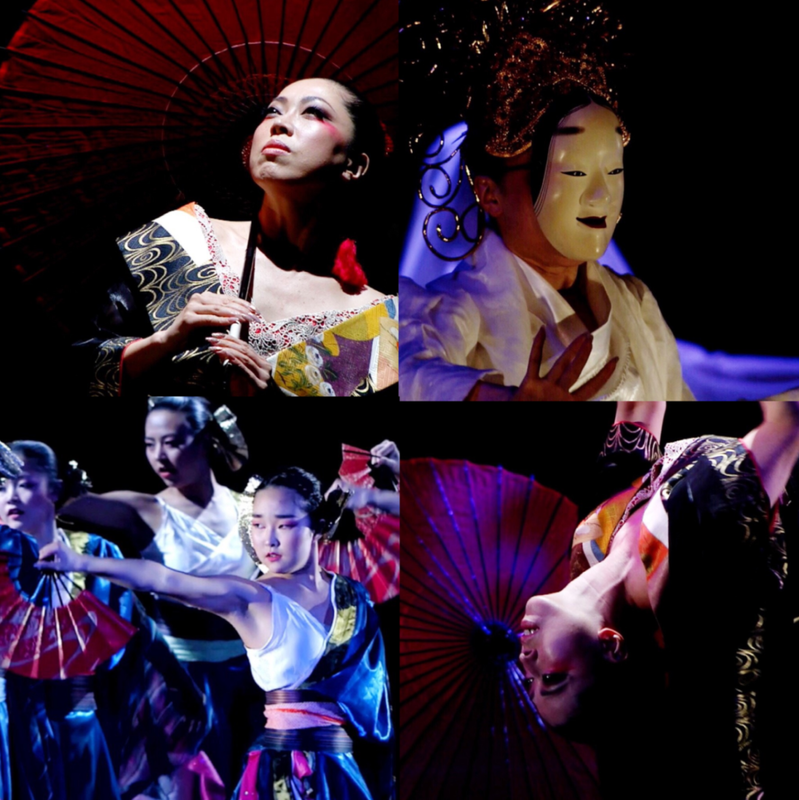 Japan has many different types of traditional theatre such as Noh and Kabuki. We want to protect these types of theatre as we move on in to the future! However we also think that the [Japaneseness] isn't found only in these traditional types of arts. This feeling of [Japaneseness] or [Atmosphere] is something we feel in our heart. 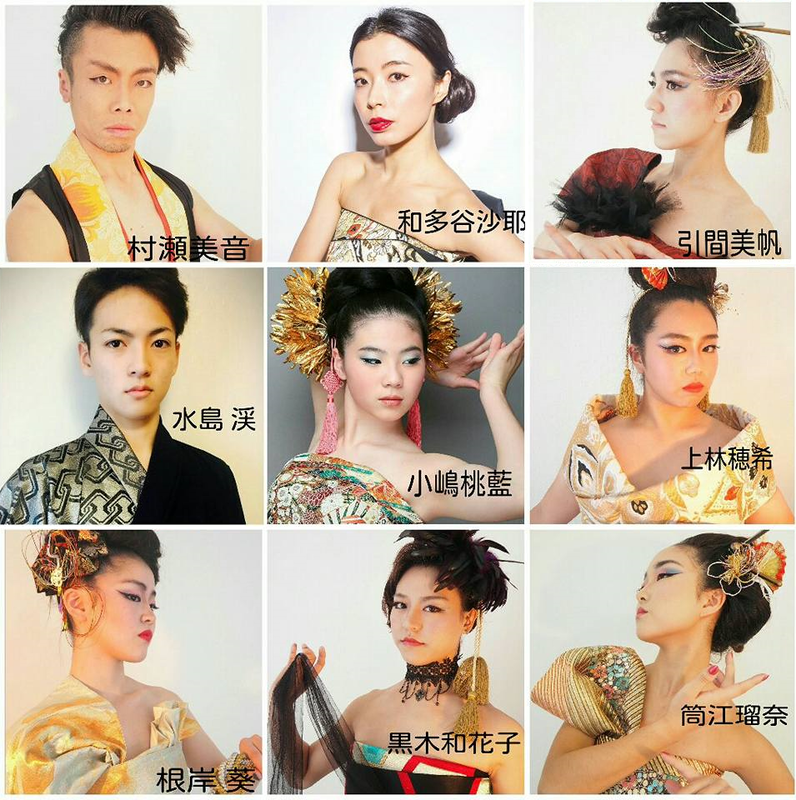 Because we want people everyone, not just Japanese people, to fall in love with Japan, we want to introduce this [Japaneseness] via our own performances! [You don't need words to be moved]: This expression is a shared ideal between us here at the Izanami project. If you feel the same just a little bit, please consider backing the project and coming to see us on March 23rd when we perform MIYABI for the first time in Japan!! ・Special footage available only to those that back the project, view-able online! Please choose between afternoon viewing or evening viewing and write in the remarks. 1x Performance Ticket (VIP seating!) ＋J Funding Special Goods! 2x Performance Tickets (Free Seating) ＋J Funding Special footage from the performance + special bonus IZANAMI project clear file for each guest! ・Bonus IZANAMI project clear file for each guest! Please choose between afternoon viewing or evening viewing and write in the remarks. 3x Performance Tickets (Free Seating) ＋J Funding Special footage from the performance + special bonus IZANAMI project clear file for each guest! 2x Performance Tickets (Free Seating) ＋J Funding Special footage from the performance on 23rd March 2019+ special bonus IZANAMI project clear file for each guest! 「Afternoon Show」Ticket To See A ONCE In A Lifetime Show!「Afternoon Show」Ticket To See A ONCE In A Lifetime Show! + ORIGINAL GOODS! !「Evening Show」Ticket To See A ONCE In A Lifetime Show! + ORIGINAL GOODS! !「Limited to Afternoon Show Only!」VIP Ticket To See A ONCE In A Lifetime Show! + Meet and Greet with the Cast! !「Afternoon Show」Pair Tickets To See A ONCE In A Lifetime Show!「Afternoon Show」Tickets for a Trio To See A ONCE In A Lifetime Show!「Evening Show」Ticket To See A ONCE In A Lifetime Show!「Evening Show」Pair Tickets To See A ONCE In A Lifetime Show!「Evening Show」Tickets for a Trio To See A ONCE In A Lifetime Show!